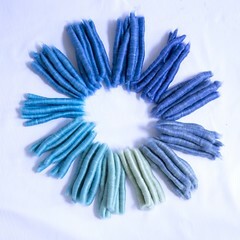 I knit, crochet, spin, and have done some experimenting with weaving and natural dye. I’m also a technical writer, mom to 3 boys, and enjoy gardening. A while ago, a wrote about learning how to make rolags on my drum carder this spring. After coming up with a few combinations of gifted roving, I made sets of gradients between two colors, starting with a bright green and an aqua. I’ve done this before – when I made my first Bohus cardigan. This time, both the rovings are 80% merino, 20% silk; I didn’t want to blend textures or qualities like shine from the silk thanks to an earlier recent rolag experiment blending two dissimilar fibers together. First, I made rolags of the solids, weighing out 20 g of each. Then I mixed them 50-50, with 10 g of aqua and 10 g of green. Finally, I mixed them 25-75, with 5 g of one color and 15 g of the other. I really love these colors and how they blended, but I started to think about adding a third color. When arranged on a flat lay or diagrammed on a piece of paper, I had a straight line of aqua->gradients->green, but if I added a third color, I could make a circle, which I did. The third color, blue, has a slightly different fiber content – 70% merino, 30% silk – it’s definitely a different roving base as the roving is very thin, perhaps half as thin as the other two rovings, and the silk has some nubs and chunkier texture than the other two, but it’s close enough in texture that it’s not too noticeable. Just before Tour de Fleece started I decided to warm up and spin the circle. I didn’t think about how much yarn the circle would make, but that’s 240 g of roving, about 8 1/2 oz of fiber. I realized during the first gradient that it wouldn’t all fit on one bobbin, so I spun from blue to the last gradient before aqua, started a new bobbin for aqua to the last gradient before green, and then one more for green to the last gradient before blue. During spinning, I was thinking both actively and in the background about what to make. (You know when you have a problem to solve but actively thinking about it doesn’t help so you take a walk and while thinking about something else the answer comes to you? That’s what I mean.) I really wanted to maintain the circle idea, but the only thing I could think of that would work was an infinity cowl, but I knew I was going to end up with much more than a cowl’s worth of yarn. I decided I’d make a scarf instead, casting on lengthwise and knitting all through the gradients. To keep the colors all evenly striped, I’d need to spin 20 g more of one of the solids – I picked blue. 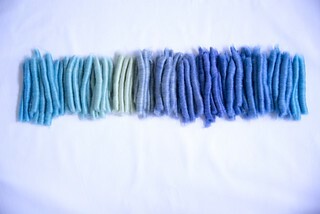 For the picture above, I chose aqua but evenly divided one 20 g set of rolags for the photo. I chose the blue because is a much darker hue than the aqua or green and it could act as a frame for the two lighter colors. Also, I’m not entirely happy at how much more dominant the blue is because it is so much darker; the aqua to green transition is much more subtle than either of the transitions to/from blue – something I’ll need to compensate for the next time I do this. I chain plied everything and while skeining it, spit-spliced the ends to make one giant skein. I washed and whacked it, let it dry, and then gave my jumbo ball winder a workout. That’s a US quarter in the picture for scale – this is perhaps the largest yarn cake I’ve ever made; it was almost too big for the jumbo ball winder. The finished 3 ply sport weight yarn is about 768 yards and weighs 279 g. I’ll post about the scarf I’m making with it once it’s done and I have some fancy pictures of it. I might exercise my math muscle a little more to make smaller rolag quantities. I honestly picked 20 g because it is so easily divided into the necessary portions. As I mentioned, the darkness of the blue bothers me. I’d like to either figure out how to properly blend a dark color with a light for a more subtle transition or stick with colors with the same … values? Is that the right word? I need to read a book about color theory and blending. For symmetry, I would repeat one of the other colors, making one the center. The yarn I made has blue, light green, aqua, blue stripes. My circle idea would be abandoned, but the resulting skein and FOs made from it would be more pleasing to the eye and my sense of order if it had blue, light green, aqua, light green, blue stripes (or with light green in the center). Stay tuned! Fancy pictures and scarf details are forthcoming! I haven’t forgotten entirely about this blog; since paying for the domain it’s been weighing on me because I haven’t been using it. It reminds me of the time my parents paid out of pocket for a season’s ski pass at our local ski area (out of pocket because in previous years my Dad worked there on weekends and I got his free season pass) and I used it three times that winter. The winter before I broke my leg skiing, so I guess that helps explain it. Well, I didn’t break my fingers (or my brain, though a few times I’ve wondered), and I just finished Tour de Fleece, so let me tell you about that. I joined two teams on Ravelry this year but I spent my time on Instagram looking at one team’s pics and the general TdF hashtags. My favorite part of participating is getting to see what everyone else is doing and I’ve become so acclimated to Instagram that Ravelry seems tedious to scroll through now. Maybe next year I’ll be better, or maybe next year I’ll be a rebel and just participate on Instagram? Or start my own team that communicates mainly on IG? That’s certainly something to think about. My goal this year was to spin 15 minutes a day for each day of the tour, knowing that I would take non-standard rest days due to a weekend trip to Norfolk, VA. I actually ended up taking three rest days instead of two (there are two, right? ); the Saturday and Sunday of the Norfolk trip I didn’t spin, and this Saturday I didn’t spin. But I honestly am not too upset about this. Last year I stopped not too far into the Tour to knit a commissioned shawl for an old friend, so I’m happy I was able to stick with it this year. I haven’t tallied up my yardage or checked WPI on these, but here’s my yarn family photo from Tour de Fleece 2018. Three Waters Farm Fall Folderol (40% merino, 40% superwash merino, 20% Silk – Tussah). I’ve been puzzling over why one would want both merino and superwash merino in the same top, but that’s a question to investigate another day. Pigeon Roof Studios (who’s no longer dyeing) Land and Sky OOAK (100% extra fine merino). I spun this thicker than my usual, so it’s a heavy worsted or aran and super bouffy. Spunky Eclectic Joshua Tree (65% Wool – Polwarth, 25% Goat – Mohair, 10% Silk). This goes perfectly with my next spin, which I acquired 6 months after this one. 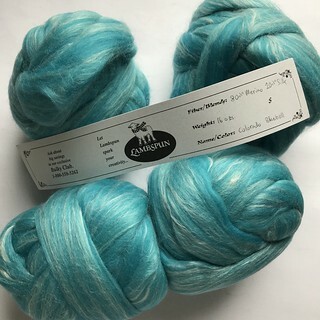 The Fiberists Specimen 209 (85% BFL, 15% Silk – Tussah). I know Reggie and Spencer personally and was thrilled to find two braids of this in my Shrödinger’s bag (their version of a grab bag). You should check them out; they just got a line of enamal pins that are really, really cute and I want them all but I really need Dr. Mori. The purples are both 4 oz braids of Targhee that I’ve had in my stash since 2010. It was time to take the plunge and dye them and spin them. So that’s 28 ounces of wool that I spun for TdF! Huzzah! More on those bumps I dyed myself … My Mom’s birthday is August 1 and she like purple, so I thought I’d dye and spin these braids for her – she knits and crochets. The first skein I spun almost like a fractal; I divided the roving into 3 lengths. I spun the first one end to end, the second one end to end but the opposite ends of the first (if that makes sense), and the third I divided into as many strips as possible. The resulting yarn varies pleasingly in color, but I spun it short forward draw (my go-to) and I don’t think the yarn really takes advantage of the bounce and crimp in the fiber. So I divided the second bump into three equal portions based on color: red, white, blue. (How patriotic!) 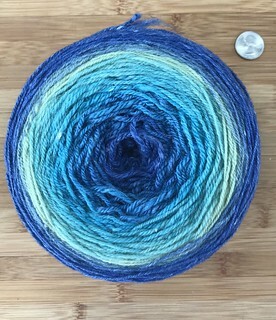 I carded each color, made rolags, and spun this one (mostly) long backward draw. The resulting yarn is squishy and bouncy, but the color is on par with butcher’s twine for me – it just looks really boring. So as I type this, it’s cooling off in a dye pot because I overdyed it with violet. Phew. Now I need to count yardarge and update my stash on Ravelry with everything. That may be a good task for tomorrow since (hey!) I actually wrote a blog post! I hope that if you did the Tour, you had fun! I’ve rediscovered my drum carder and learned a new trick: making rolags. It all started when a friend was thinning out the fiber stash she inherited from her mother in law, who passed away a few years ago. She’s been steadily going through everything, including Christmas ornaments & decorations her father in law couldn’t bear to part with and drove cross country to deliver. I gratefully took all of the fiber that she and another friend weren’t interested in, which more than doubled my fiber stash. What to do with it all? It’s a bit more than what I can conceive of spinning myself. I do have an etsy shop though, so could sell it but can’t quite square making money of fiber I got for free because of someone’s death. But I am involved with a group raising money for a local charity, so why not donate proceeds to them? This has been the perfect solution. I’ve raised a little over $17 for Stillbrave, a local non-profit led by Tattoo Tom (yes, he is a character and yes, he is quite dedicated) that provides non-medical support to children with cancer and their families. I first heard about and got involved with Stillbrave while playing roller derby and the good friend I do tae kwon do with is still involved with them. So, the rolag making! I watched a few youtube videos and grabbed some dowels and got started. The optical color blending of colors has been interesting and actually surprising in one case. This and two other colors are available in The Yarn Office, my etsy shop and (as I’ve come to think of it) vanity project that I’ve sunk more money into than I’ve made. But it’s there, and what else would I do with some of this stuff, which I created not because I had a specific use in mind but because I could. I think all of that may be a blog post for another day. 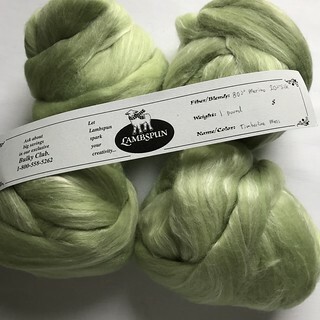 In the mean time, if you spin, please have a look at the rolags & one batt listed in the shop – you can help put a smile on a sick child’s face or help ease the burden for parents and siblings of the sick child. I wrote earlier this week about mending jeans and the reBUTTal hashtag. Out of all my possible reBUTTals, I decided to embroider BELIEVE WOMEN on the back pocket of my current favorite jeans. After taking the pocket off the jeans, I wrote the words on the pocket with a marker that washes out in the laundry. Then I searched high a low for my embroidery needles and could find them, so I had to go to JoAnn. I ended up picking up some DMC Cotton Perl embroidery thread along with the needles – it’s not quite as shiny as the usual embroidery thread, but it’s colorfast. It’s also not divisible into individual strands/plies. I probably should’ve chosen a different color, although I do like how subtle the final pocket is. At least the message is positive if no one can make out WOMEN – I’ll happily wear these. I sewed the pocket back on by hand using thread made by Singer that’s specifically for jeans. (Note that I patched the pocket holes before sewing the pocket back on.) It’s a bit thicker and sturdier than regular thread. Most surprising to me was how easily the needle went through 3-4 layers of denim; I thought I’d need to break out the thimble, but there were only a few times I needed to put the eye end of the needle on something hard to push it through. I also used this thread to mend the holes in this pair of jeans and another pair that had a rip in the crotch from my lunging to move a wedding dress. I patched all the holes from the inside using denim cannibalized from a ruined pair of Henry’s jeans and did some sashiko embroidery to keep the patches in place. I’m a little worried that I didn’t finish the edges of the patches, but trust that the sashiko stitches will keep the fabric strong. While I was at JoAnn, I also decided to upgrade my sewing needles storage. I’ve been using this Crowleys needle case for as long as I’ve had my own needles; I’m not sure if it’s my Mom’s or if it’s from my Great Grandmother Smith. About a month ago, my husband needed a needle and spilled them all on the floor of our dining room. The new needle cases have less charm, but they do have a magnet in them that doesn’t come out when you tilt the case, so there’s nearly no chance that he’ll be able to spill all the needles again. The new cases don’t have the same charm as the Crowleys case, which I’m going to figure out another use for (or at least display it somewhere) so I can still see it and handle it. And now it’s back to knitting baby shower gifts that I can’t show you until after the shower! One of my favorite pairs of jeans developed a hole where the top of right back pocket attaches. I kept wearing them. The hole got a little bigger and I just wore longer shirts. Finally, I heard them rip one day as I was getting out of the car to go grocery shopping. Thankfully, it was cold and I was wearing my winter coat, which ends about mid-thigh on me, so no one could see the rip. I knew I had to mend them but wasn’t planning on doing it anytime soon, just at some vague point in the future. Then I saw a post from badasscrossstitch on instagram. She had one of her embroidery designs stolen by a jeans-maker who popped it onto the back pocket of a pair of skinny jeans without permission. She wrote a whole blog post about it and then, making lemonade out of a lemon of a situation, she started embroidering other designs on the back pocket of her jeans, wrote a tutorial on how to do it on her blog, and then started the #reBUTTal hashtag on instagram. This has inspired me to do the same to my holy jeans. I took the pocket off my jeans this morning and will patch the holes – yes, there’s another one on the other corner of the pocket, and another small hole starting at one of the corners on the other back pocket – when it rains, it pours, I guess. At least I realized it now, during the mending process and not right after mending them. I’m going to cannibalize a pair of Henry’s jeans that are too small for him now. I haven’t quite decided if I’m going to use my sewing machine to patch them discretely or if I’m going to use embroidery and patch them visibly, maybe with sashiko (Japanese technique for mending). I did at least get one pocket off along with all the bits of thread. I need to think about if I want to take the other pocket off or try patching with it on. Do you have suggestions? Even if it’s not a suggestion, what would you put on your jeans if you were embroidering a back pocket? Lola, also known as Lola Bird or Lola B, had an early morning appointment today with Dr. Hussian. She was born in early September and I put her spaying appointment off partly out of an unrealistic fantasy that I could mate our little black polydactyl with another guy polydactyl for little polydactyl kittens. Given my present non-farm-like set up and the words of KittenLady (among others) encouraging me to spay her, I bowed to pressure. I also put it off a bit because my husband was between contracts, but he’s gotten something so some of the financial pressure is off. Off to the vet we went this morning. I got a call at 11 from Dr. Hussian saying everything went fine, and then I got a text at 12 with this picture and the caption text. She doesn’t look too pleased, does she? I picked her up at 5, which brings me to my trip to the bookstore. I had 40 minutes between dropping Henry off at taekwondo and the time I needed to be at the vet. I thought about going to Starbucks for a coffee, but decided not to waste my money since I wasn’t really in the mood for coffee. So I went to the bookstore. I came out with the middle 3 books in the stack below. I’m currently reading The Amazons by Adrienne Mayor – it’s fascinating and detailed and sometimes overwhelming; I can only read so much of it (perhaps a chapter at a time) before I shut down and stop absorbing it. So I need to balance it with other books. I just finished reading Cults Inside Out by Rick Alan Ross, which I may write another post about. For now, let me just say it’s well written and a solid resource for information. My trip to the bookstore wasn’t entirely needed, though, since I have The Quick and the Dead by Joy Williams on deck. Who could resist a new-to-you Alice Hoffman or A. M. Homes? And I love the movie version of Something Wicked This Way Comes as well as Ray Bradbury’s writing (I recently read the other two books in his loosely autobiographical Green Town series), so I should really read and own the book, right? I mean anyone in my position would do the same. Now I just need to pick something to start (or continue!) while I sit with my Lola B tonight. She’s confined to the master bedroom, and while I left her cowering under the bed desperately trying to get the cone off, I can hear her running around as I type this – I’m sure she’ll be fine, right? She wouldn’t do more than what her body can handle right now, right? sigh This is worse than having an injured toddler, I think.